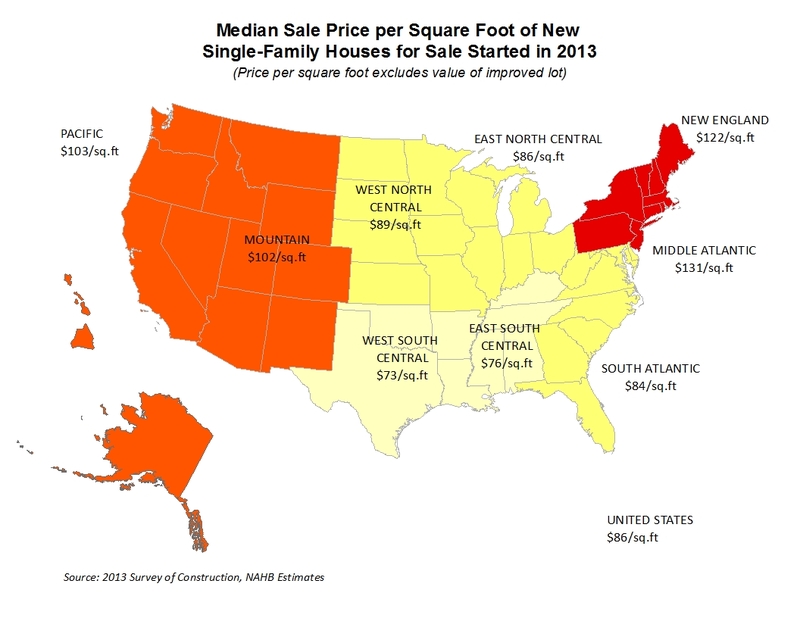 Looking at single-family homes started in 2013, new NAHB research quantifies regional differences in sale and contract prices per square foot. The prices excluding lot values range from $145 per square foot for contractor-built homes in the Pacific division to $73 per square foot for speculatively-built homes in the West South Central division. The NAHB analysis is based on the Survey of Construction (SOC) data. The survey information comes from interviews of builders and owners of the selected new houses. The SOC differentiates between houses built for sale, houses built by contractors, owners and for rent. Built for sale are houses built on builder’s land with the intention of selling the house and land in one transaction. These are often called speculatively-built or spec houses. Contractor-built or owner-built houses are built for owner occupancy on owner’s land with either the owner or a builder acting as the general contractor and are often referred to as custom homes. Contract prices of new contractor-built homes do not include value of improved lot and, typically, are lower than sale prices of spec homes. To make comparison more meaningful the cost of lot development is excluded from sale prices and prices are compared on a per foot basis. The most expensive homes are contractor-built homes in the Pacific and New England divisions with median contract price of $145 and $143 per square foot, respectively. The most economical homes are started in the South region, where median sale prices per square foot (excluding lot value) range from $73 in the West South Central division to $84 in the South Atlantic division, consistently below the national median sale price of $86 per square foot. 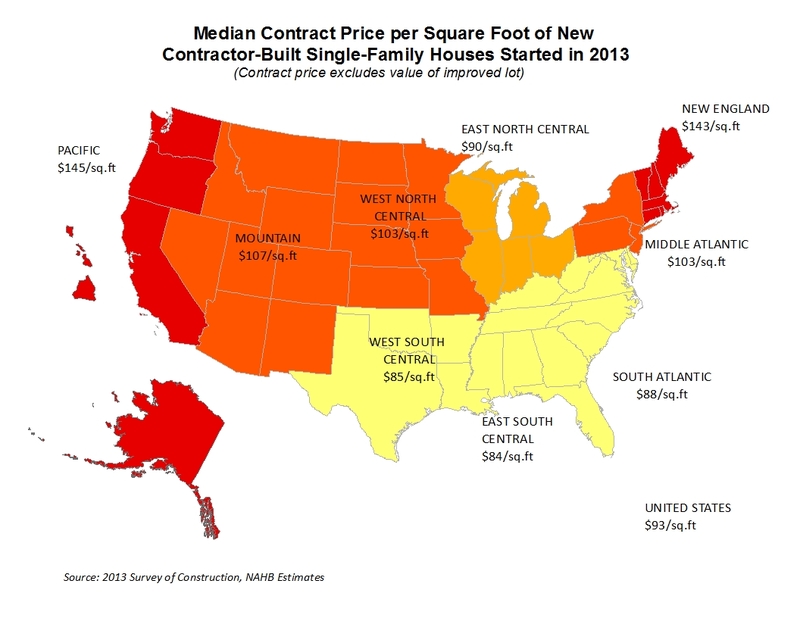 Looking at the contractor-built starts in the South, prices per square foot are slightly higher ranging from $84 in the East South Central division to $88 in the South Atlantic division but still well below the national median contract price of $93 per square foot. Typically, contractor-built custom homes are more expensive per square foot than spec homes, suggesting that new custom home buyers are not only willing to wait longer to move into a new home but also pay extra for more expensive features and materials. The exception is the Middle Atlantic division where spec homes cost more per square foot than contractor-built homes, $131 versus $103. This makes the Middle Atlantic division home to the most expensive (in terms of price per square foot) new single-family spec houses. What “square footage” are you speaking of here? I am in western North Carolina and “finished” or “heated” square footage sales prices are significantly higher than these numbers (our cost to build is significantly higher as well) and assume your square footage $ is based on total square footage including garage and other unfinished areas. For the square footage statistics, the Census Bureau uses all completely finished floor space, including space in basements and attics with finished walls, floors, and ceilings. This does not include a garage, carport, porch, unfinished attic or utility room, or any unfinished area of the basement. However, to make contract and sale prices per square foot comparable, the prices reported here do not include the cost of raw land and lot development. It would be interesting to analyze the numbers given, alongside relevant codes, an ongoing mystery for policy makers. To what extent does the enhanced codes / standards in both New England and Pacific regions equate to a 50% uplift in construction cost? ?